NASA has been baffled by what could cause of two large ‘bright spots’ in a crater on its 580-mile wide surface since they were first pictured by the US space agency’s Dawn probe February from a distance of 29,000 miles. Theories have renaged from reflective ice patches or signs of ice volcanoes, or cryovolcanos, which form on icy moons or asteroids, erupting contaminated water which solidifies, instead of magma, to more far-fetched ones including it being an alien space station like the Star Wars Death Star. Now, as the unmanned probe, gets even closer, the latest images, from 13,500 kms above at a resolution of 1.3 kilometers per pixel, just released by NASA show the two large lights in a crater now dubbed the ‘great whites’ are actually a series of much smaller spots together. The images have also shown the ‘Great Whites” are not the only bright spots on the surface. There are many different ones dotting the planet, including huge cracks that stretch nearly a quarter of the circumference and others which are linked to bright rays of material, which scientits feel could be after effets of comet or asteroid strikes. Ever since news of the lights spread, UFO hunters have speculated they could be light sources made by alien inhabitants, with the more bizarre theories including it signalling Ceres is actually a well-hidden alien space station. News of lights being more widespread has only feulled this with one speculator commenting on an online forum that “It could be that these are like the lights of cities on earth which are visible from space” and that Dawn may be about to discover something “historic”. But scientsist seem more convinced they are going to find ice is the cause. The relatively high resolution has allowed astronomers to compare the brightness and flatness of some spots to what would be expected of sunlight on ice. Christopher Russell, principal investigator for the Dawn mission at the University of California, Los Angeles, said: “As our pictures have increased in resolution, the brightest spot broke into two spots, and now we can see a whole field of tiny spots in that crater.“We are now sure that the light could be sunlight bouncing back from the surface, similar to what we would expect from a reflection from ice on the surface.”But it still poses questions as ice should not be stable on the small planet’s airless surface, and would be expectoed to evaporate.Mark Sykes, director of the Planetary Science Institute and a Dawn co-investigator, says the “Great White Spots,” might mostly be salty crusts left behind after mineral-rich water ice vaporizes away. By June 6 Dawn will be just 2,600 miles above the planet and they hope to learn more then. Since all the uncertainty began, NASA called for help from the public last month after the conspiracy theorists’ wild speculations online. The website says: “Can you guess what’s creating those unusual bright spots on Ceres? On March 6, NASA’s Dawn spacecraft began orbiting Ceres, the largest body in the main asteroid belt between Mars and Jupiter. The poll came after UFO forums speculated the mystery lights could have been put there by aliens trying to contact other beings. But the lack of certainty triggered speculation among online UFO hunters that they must have been created by extraterrestrials. 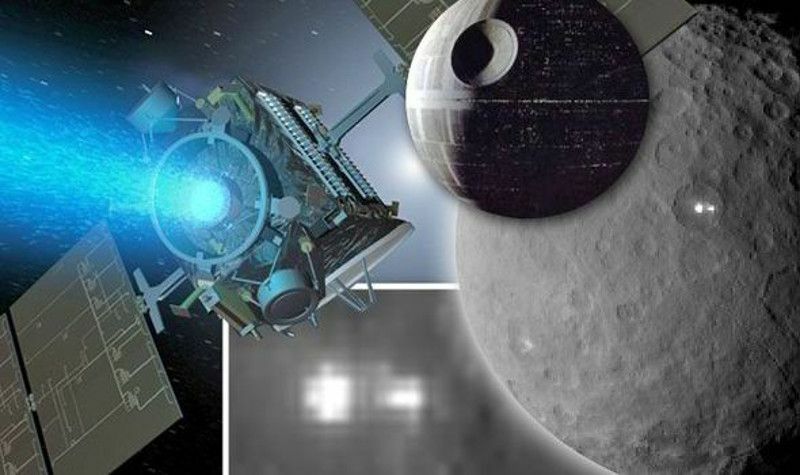 Many online forums are claiming that the presence of the lights must mean Ceres is an alien-made mega space station, like the Star Wars Death Star, which has been disguised as a planet, or a mining outpost. One poster wrote on www.ufosightingsdaily.com: “The light is white, like city lights, not orange or red like a volcano. That rules out volcano. “The light is not one, but two. You will see the two glowing objects have different shapes. The largest is a white glowing square, the smaller is a triangle. Still think its a volcano? “Ceres is the largest object in the asteroid belt and is only 950km in diameter. These are massive doors that open to allow ships in and out. Another posted: “These two spots are surely non-natural occurrences. What are the chances of having double erupting volcano craters within a giant crater basin? “Bright white light emitting even when Ceres is turning to the dark side rotation clearly indicates that the origin of the light is artificially made. Other alien fanatics were more cautions, urging to wait until the probe gets nearer. The latest pictures of the small planet showing the lights were taken last week. Dawn has been orbiting Ceres since March. It is hoped as it gets closer it will become clear what the lights are. Images of the north pole of Ceres taken on April 10 from 21,000km did not show the lights. However, they were visible in other close-up colour images taken since March which were used to create a map of the surface. Nasa hopes to get a closer look at the spots when Dawn gets even closer next month.